Let me say this right up front -- this song is out and out schlock. But schlock in the good sense, if you think that is possible. "Shannon" was not going to change the course of music, and I don't know how many musicians would cite it as a "major influence." So what. You have to admire a song about a dog getting caught in the tide and drowning out at sea. Yes. That's what I said. And it reached #6 on the charts. Oh my God, what can you say about that chorus? This is truly a guilty pleasure single. Gross was a founder and guitarist for 50's rock revivalists Sha-Na-Na, a "greaser" dressing group who not only went on to perform at Woodstock in 1969, but had their own variety comedy show afterwards. He left the group, put out two solo albums that didn't make much of a ripple, and then signed to Lifesong Records, put out the Release album, and Shannon took off to the top of the charts. That was Gross' biggest and only true hit. After his next few albums fizzled, Gross moved to Nashville to write songs for others and periodically record as well. 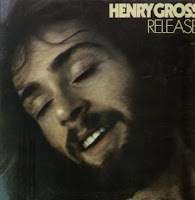 You can find out more on www.henrygross.com. Besides the neat video below with the original Lifesong 45 playing, you owe it to yourself to see a rather impressive, but amusing video of this guy playing "Shannon" solo on his acoustic guitar, singing along, even the tough falsetto parts.